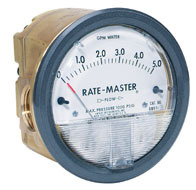 Rate-Master® Dial-Type Flowmeters have a machined brass meter body. Applications include calculating required fill or drain times for tanks and monitoring water consumption to different processes and operations. 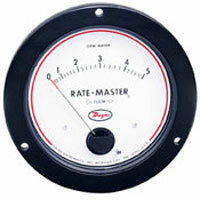 Rate-Master® Dial-Type Flowmeters measure higher water flow rates. Applies to monitoring coolant flow through ingot heaters, resistance welders, heat exchangers, compressors or scrubbers. Variable-Area Flowmeter for Gases measures gas flow rates. Applications include backflow prevention, heat exchangers, oil & gas equipment, and hydraulic equipment. Variable-Area Flowmeter for Oil measures oil rates. Comes calibrated for horizontal in line mounting. A few applications include heat exchangers, oil & gas equipment, and backflow prevention. Fixed-Orifice Flowmeter for Low Flow Rates measures water, oil, or air flow rates with accuracy. Excellent choice for high line pressure applications. Variable-Area Flowmeter for Liquids measures water flow rates. Comes pre-calibrated for horizontal in-line mounting. A few applications include backflow prevention and heat exchangers.